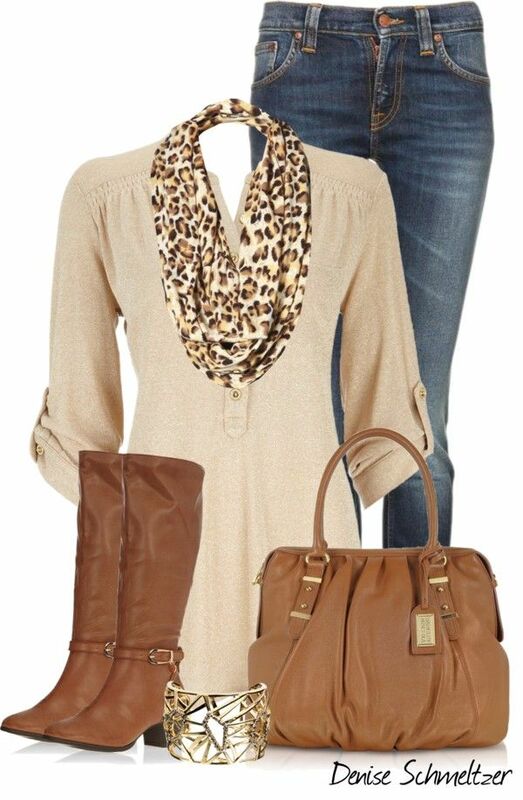 Animal print and cognac accessories , enough said..
Another option with similar elements. Black and white with a pop of cobalt..
Or all black with a pop of cobalt..
Have you seen this neat trick? 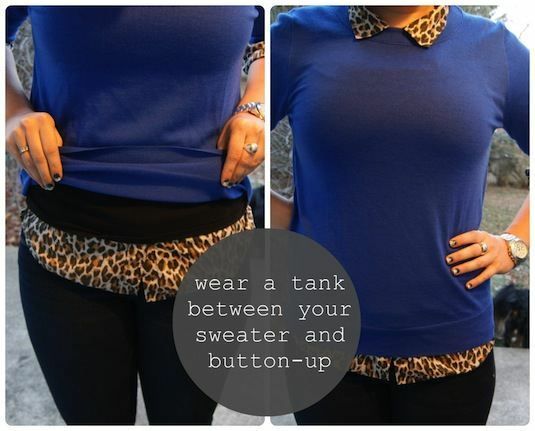 Wearing a tight tank over a button up blouse to slim down the look of the blouse underneath.. Here is a quick cheat sheet on colors to pair togethers? Dear Readers, Are than any color combos on the cheat sheet that appeal to you? I think I’ve done a lot of these, but love the Aqua ones as neutrals and yellow are all that come to mind for me.. I have tickets to The Nutcracker for tomorrow night and I am planning extra bowling practice on Sunday! I love your comments, so make a bloggers day! I am grateful that my son’s bump on the head didn’t require stitches..Yes the fun of boys.. I am grateful that my oldest finished his semester this week and is getting a nice break. I am grateful my husband continues to bring home consistent paychecks and is on his way to getting a new vehicle that won’t hurt his hip when getting in and out, like his van does.. I am grateful that my dearest friend is being supported by her church and going to make it home for the holidays to Canada! I am grateful that my friend’s 8 year old daughter wants Santa to come while they are in Canada, and that Auntie Tracey gets the privilege of creating that magic! 7 Responses to "Pinterest Inspirtations"
Ooh…I like that colour chart you provided. Very handy, thank you. You are welcome, thanks for commenting! I really like neutral colors so my fav looks where the first two looks. However I am intrigued by the pops of color! Thanks for including the color cheat sheet! That will help me to make some interesting visual matches! Love the Aqua tones! Blessings! Hi, Tracey. Have gotten so far behind in my blog reading this past week or so. My favorites are the top two with the leopard. Am loving the simple basics of a tank or tee with scarf to accessorize… and topper of some sort for colder months. Have fun seeing The Nutcracker! Thanks Lisa… We got a wonderful surprise when the package came and included not just the ballet tickets, but a night at the Westin Hotel across from the center and a gift card for dinner at Ruth Chris.. We are wowed! Wow! What a nice date!